The safe alternative to back or neck surgery providing relief of back and neck pain. 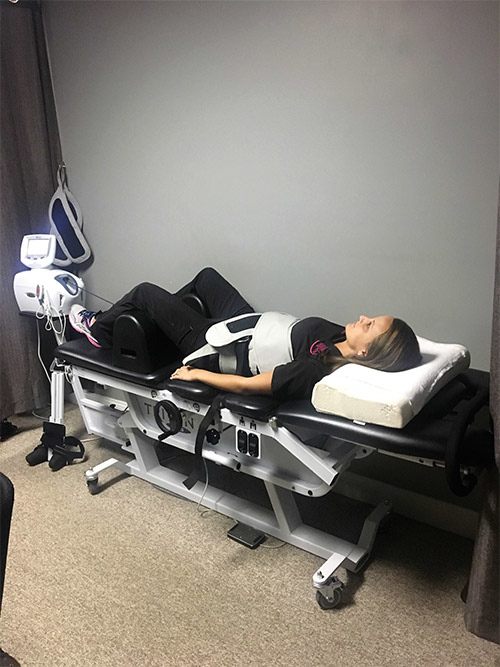 If you suffer from back pain due to herniated disk, degenerative disc disease, bulging discs, torn disc, ruptured disc, sciatica, spinal stenosis, facet syndrome or any of the other common causes of low back pain, then you’ve probably heard about spinal decompression. Seems like wherever you turn you see or hear ads for this new back pain therapy. But what is it? And does it really work? The concept of tractioning a disc to relieve pressure is nothing new. Traction units in various forms have been around a long time. Until recently however, traction was unable to create meaningful disc decompression due to a protective mechanism of the body by which muscle spasms lock the spinal joint. With the advance of computer technology, researchers were able to figure out a way to avoid this protective mechanism by adding a pumping technique to the traction. This pumping technique combines a sustained traction for a short period of time with a traction release for a short period of time. The result: no protective spasm and the ability to finally open up the disc space to allow changes to occur within the discs. Research is ongoing, but all accounts to date show great promise. A very high percentage of patients report less back and leg pain and over 80% report complete relief from pain. Before and after MRI’s prove that the disc is actually being repaired with more hydration and less bulging (See research article below). Readers must be cautioned however, since not all back pain and sciatica sufferers are good candidates for this newer procedure. Spine related pain my come from a variety of sources. Though not all back and neck pain results from intervertebral discs, research suggests that 85% originated there. A disc may be injured in many ways. When injury and degeneration occurs, the layer of the disc separate and form tears, allowing a bulge or herniation to occur. Research led by Dr. Terry Yochum, DC, DACBR, ACCR reveals; spinal decompression therapy is believed to provide both biochemical and biomechanical alterations to the disc. The effects of axial spinal decompression therapy could be objectively quantified through pre and post MRIs. Another research project showed that 86% of the 219 patients who completed the therapy reported immediate resolution of symptoms, while 84% remained pain free 90 days post-treatment. Physical examination findings showed improvement in 92% of the 219 patients, and remained intact in 89% of the patients 90 days post-treatment. Spinal surgery and disc disease cost the American health care system more than $50 billion and a single surgery can cost upwards of $80,000. Clearly, non surgical solutions are a better alternative and of much less risk with remarkable cost effectiveness. 3. Thomas A. Gionis MD, JD, MBA; Clinical study, disc disease.